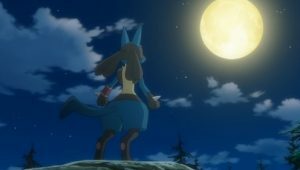 Serena brushes Fennekin and allows Bonnie to continue, making Fennekin’s fur sparkly. 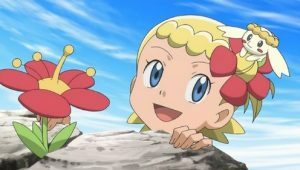 Clemont’s Chespin comes out and goes to Bonnie, who combs its hair. 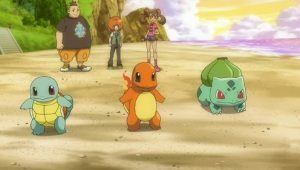 Suddenly, Shauna and Bulbasaur appear, greeting the group. 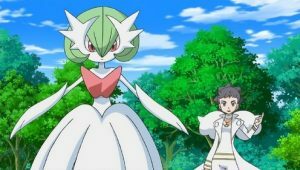 Shauna reports that Aria will make an appearance at a Pokémon Showcase. 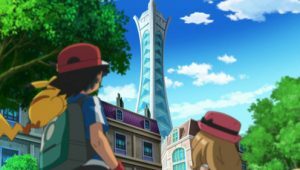 Serena is excited to finally see Aria, the Kalos Queen and Pokévisionist, in person. In the theater, the heroes watch the Showcase. 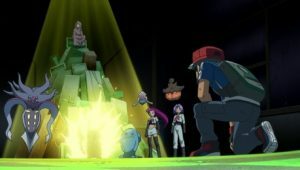 Team Rocket watch it too, and James explains to Meowth that Performers show off their Pokémon in various ways, though Jessie is not pleased with the idea. The host, Monsieur Pierre, appears and introduces Aria. Aria’s Braixen appears, who shows off its gracefulness. 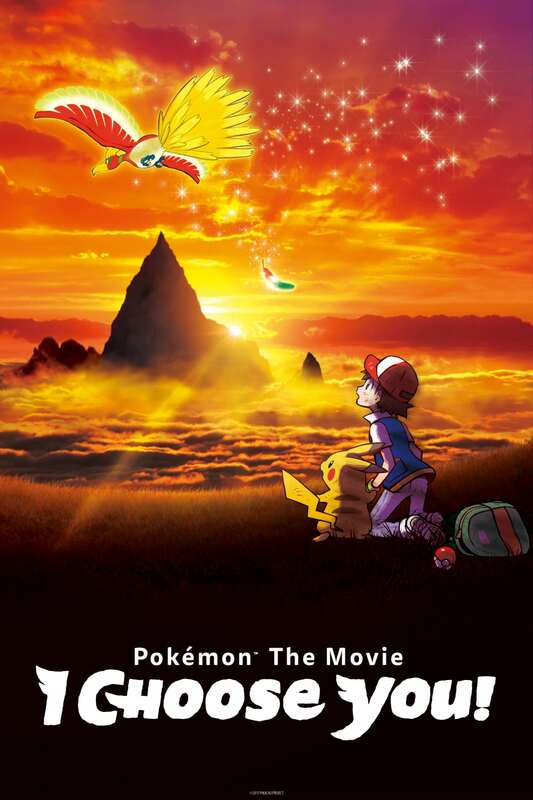 Braixen uses Fire Spin, presenting Aria. 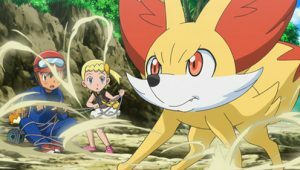 Braixen throws the branch to Aria, who throws it back to Braixen, landing it on Braixen’s head. 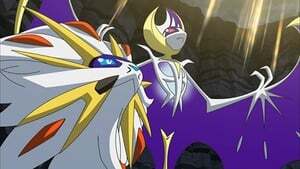 Using Fire Blast, Aria and Braixen end the show. Everyone is impressed, though Jessie thinks she can do much better. 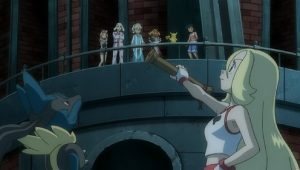 The next Performers are Kayleigh and her Furfrou, and the latter jumps through the ring Kayleigh holds up. 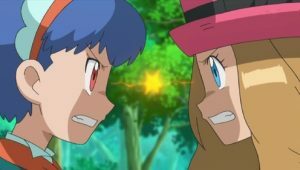 Shauna tells Serena that if someone wins the Theme Performance, they can proceed to the Freestyle Performance. 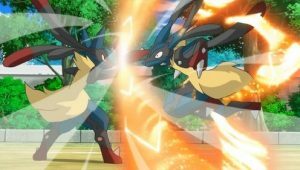 Using Double Team, Furfrou jumps with the illusions through the ring, then spins. Suddenly, a Pancham appears, who is also spinning. 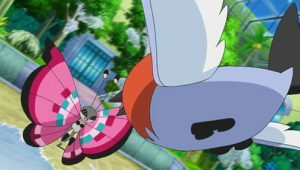 Pancham jumps on a reflector, but breaks it down, causing it to fall. Pancham pushes a cart against the stage crew, who try to get it, and then escapes. Later, the heroes compliment Aria’s performance. Shauna admits she is going to enter the Showcases, too, though she needs to train first. 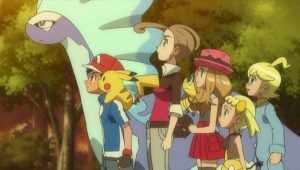 Shauna leaves, and the heroes notice Chespin trying to imitate Braixen’s moves, but failing. 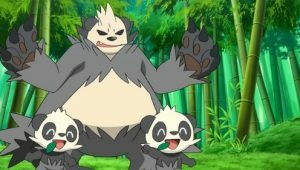 Suddenly, the Pancham from before throws a stick at Chespin and taunts him. 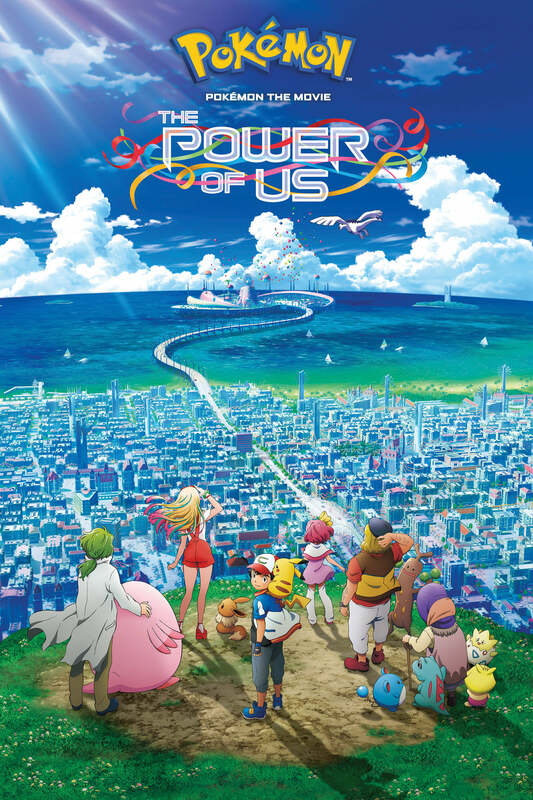 Chespin tracks it down, and the heroes try to follow it. 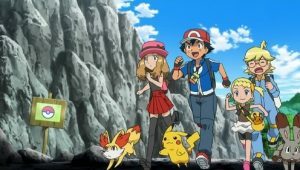 With a fork in the road, Ash and Serena split, while Bonnie and Clemont go another way. 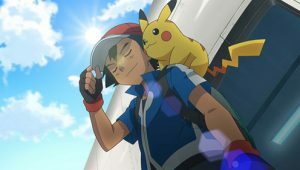 Ash is the first to find Pancham, who takes his hat and runs off. 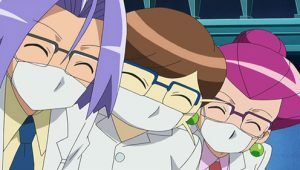 It then encounters Clemont and steals his glasses. 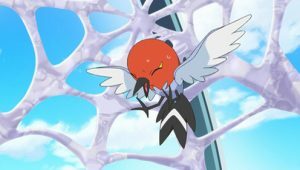 Clemont tries to run after it and bumps into something. 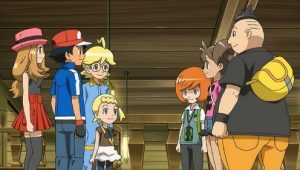 Clemont apologizes, but Bonnie points out it is just a rock. 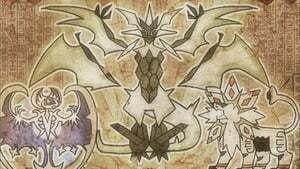 Serena and Fennekin find Pancham and observe as it leaps. 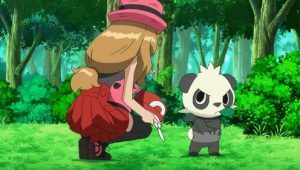 Serena realizes that Pancham just wants to perform and runs towards it. Pancham leaps away, into its cave, where it has gathered a lot of objects for its performances. 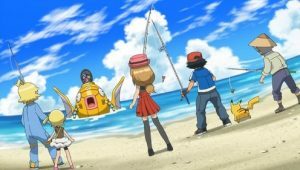 Serena offers Pancham her favorite sunglasses in exchange for Ash’s hat and Clemont’s glasses, but Pancham still runs off. 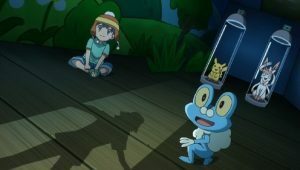 Meanwhile, Clemont and Bonnie encounter Chespin. 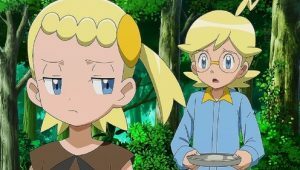 Clemont wonders where Pancham is, as he cannot see without his glasses. 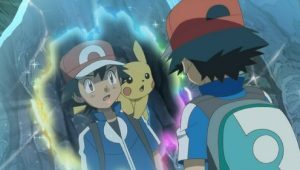 Ash arrives and notices that Clemont’s glasses have been taken. 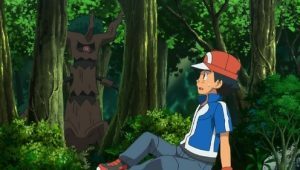 Clemont is terrified that he might talk to rocks and trees again. 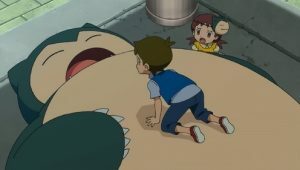 They find Pancham, who is sleeping. 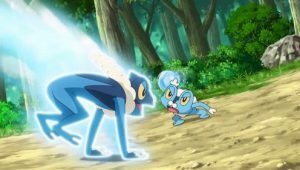 Chespin wakes Pancham up, while Ash and Clemont demand their stuff back. 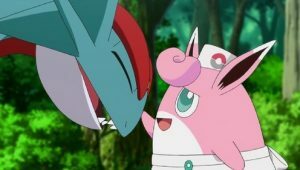 Serena arrives and expresses her wish to catch Pancham. 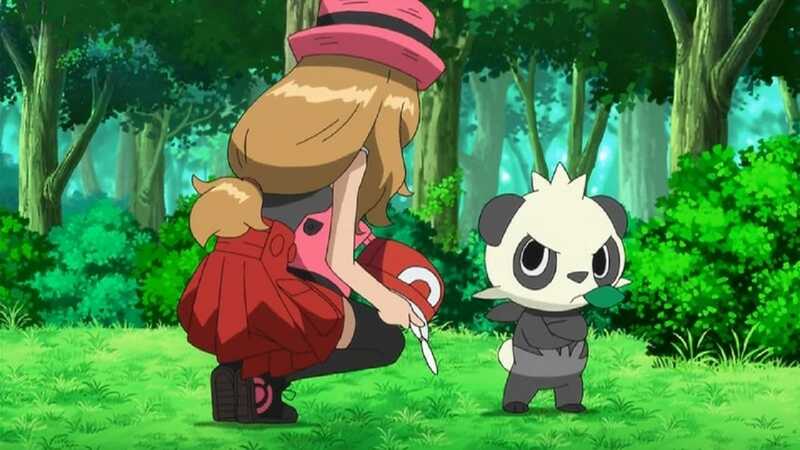 Serena points out that Pancham likes performing. 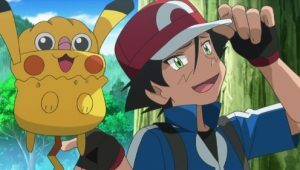 She gives Clemont his glasses and Ash his hat back. 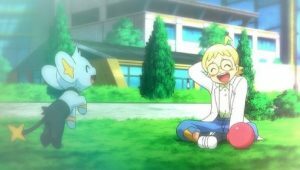 Serena feels that Pancham wants to participate in Showcases, making it blush. 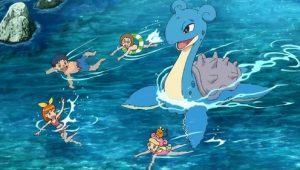 Serena has decided to participate in the Showcases, which is why she wants to catch Pancham. Fennekin and Pancham are ready to battle. Fennekin goes to Scratch Pancham, but gets captured by Team Rocket. 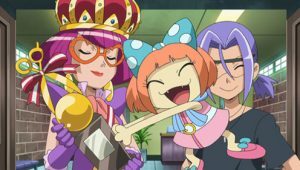 They heard that Serena wants to participate in Showcases, but Jessie tells her that one needs to be beautiful to participate, unlike Queen Aria. 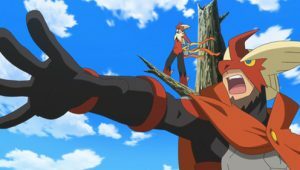 They fly off, but Ash sends out his Fletchinder, who uses Razor Wind, cutting the balloon. 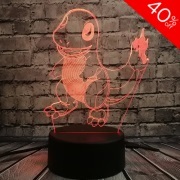 They come to the site, where Pancham uses Stone Edge, hitting Team Rocket. 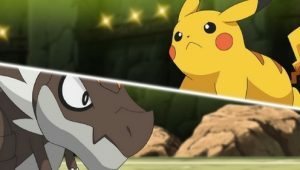 Meowth translates Pancham’s words and says that Pancham does not want anyone to interfere with its battle against Fennekin. 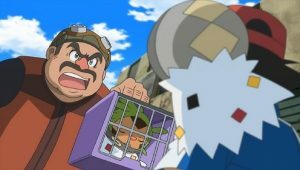 Jessie and James send out Pumpkaboo and Inkay. Inkay uses Psybeam, but misses. Pumpkaboo uses Shadow Ball, but it gets countered by Pancham’s Dark Pulse. 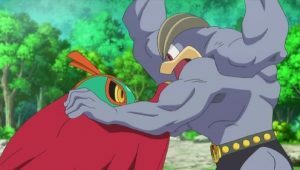 Pancham uses Dark Pulse on Inkay, while Chespin uses Pin Missile on Pumpkaboo. 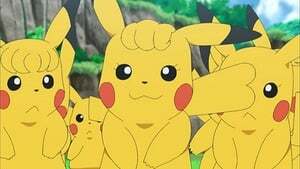 Meanwhile, Pikachu, Dedenne, and Pancham try to free Fennekin from the net surrounding it. 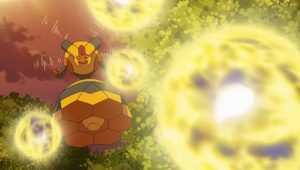 Jessie stands with Pumpkaboo over them, and the latter uses Shadow Ball. 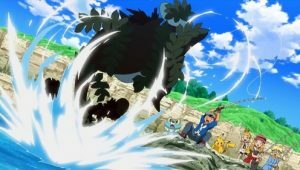 Serena runs and tackles Pumpkaboo, preventing that move from hitting them. Jessie is enraged, so Pumpkaboo goes to use Leech Seed. 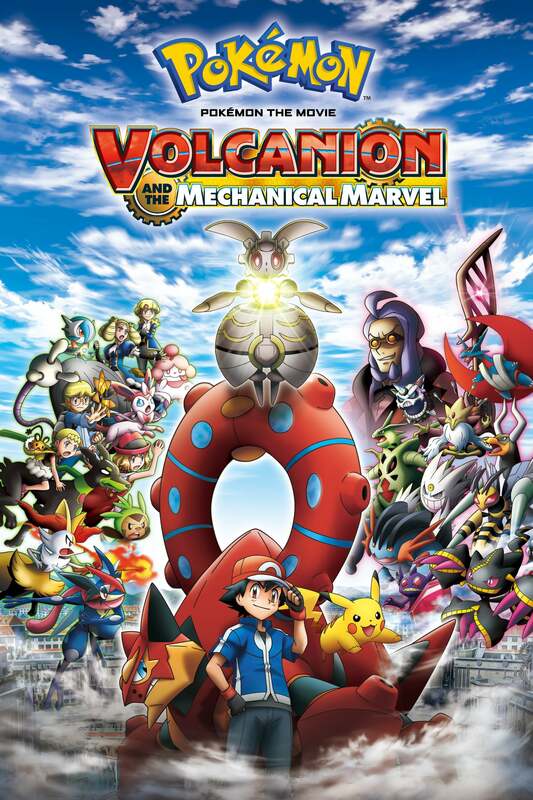 Pancham, Pikachu, and Dedenne free Fennekin, and Pancham uses Dark Pulse on Pumpkaboo. 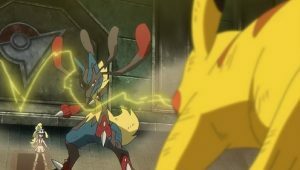 Chespin bashes Inkay, Pumpkaboo, and Meowth to Jessie and James, and Pikachu blasts them off with Thunderbolt. 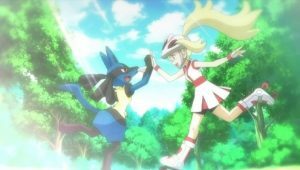 Serena thanks Pancham and asks it to battle Fennekin again. 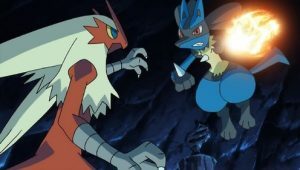 Pancham agrees and later is on the battlefield with Fennekin. 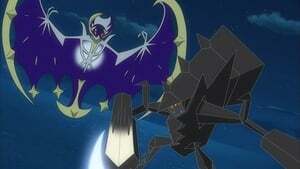 It starts with Dark Pulse, though Fennekin jumps, dodging it and uses Flamethrower on Pancham. 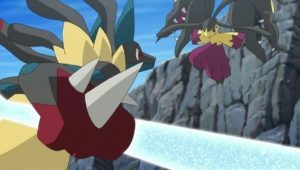 Pancham uses Arm Thrust, hitting Fennekin, who retaliates with Flamethrower. Pancham avoids the attack and uses Arm Thrust once more, though Fennekin hits it with Hidden Power. 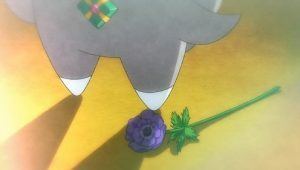 Serena uses a Poké Ball to catch Pancham, but Pancham comes out immediately. Fennekin uses Flamethrower and Hidden Power on Pancham, weakening it. 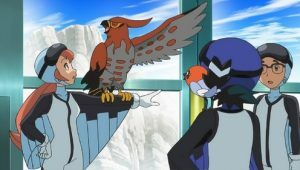 Serena begs Pancham to join her to perform on Showcases, throwing her Poké Ball and finally catching Pancham. 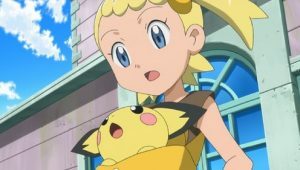 Ash, Clemont, and Bonnie congratulate her, and Serena sends out her newly-caught Pancham. She expresses her desire to become a better Performer than Aria, placing her sunglasses on Pancham. 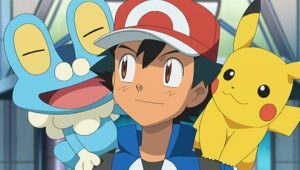 Ash and Clemont promise to fulfill their dreams. 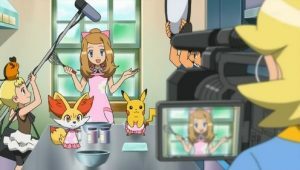 Serena asks Pancham and Fennekin to do their best in becoming Performers.